He might not get a fraction of the press some of his teammates do, but Maxime Talbot has done everything and more to earn his label as a big-game player. When you are part of a team that features two of hockey's most high-profile stars in Sidney Crosby and Evgeni Malkin, your contributions might not get the notice they deserve. But for Talbot, all 5'11” 190 pounds of him, he always manages to make people take notice. And for good reason, too. Selected 234th overall by the Pittsburgh Penguins in the 2002 NHL Entry Draft, the Quebec native has established himself as a player that comes up big in pressure situations. When the game is on the line, Talbot, who was chosen by the Rouyn-Noranda Huskies in the first round of the 2000 QMJHL Draft, knows how to deliver. And not just at the NHL level. In the 2003–04 season, Talbot finished third in scoring in the QMJHL with 98 points (25 goals, 73 assists) in 51 games with the Gatineau Olympiques. He led the team to a second consecutive QMJHL championship, while being named playoff MVP and leading the league in post-season scoring once more. He was the first to earn back-to-back Guy Lafleur Trophies (Playoff MVP) since Marc Saumier in 1987 and 1988. 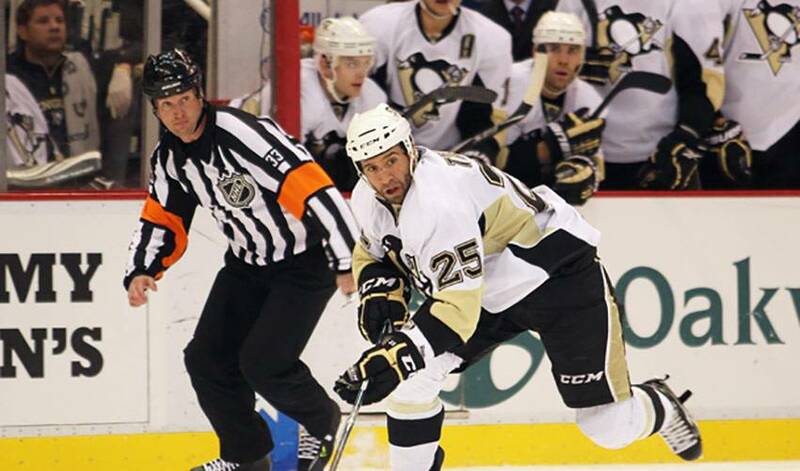 Talbot, who helped team Team Canada win a silver medal as an alternate captain in the 2004 World Junior Championships in Helsinki, played 48 games with the Penguins in 2005-06, along with 42 games with their American Hockey League affiliate in Wilkes-Barre/Scranton. He scored his first NHL goal on October 14, 2005, from centre ice against the Philadelphia Flyers. While he didn't display the same type of offensive flair he showed throughout his junior career, mainly due to his role as a penalty killer, it became readily apparent the forward was capable of scoring timely goals, complemented by an energetic crash and bang style. His tenacious work on the penalty kill and ability to chip in offensively earned Talbot rave reviews from the organization, leading to his re-signing with the Penguins on December 19, 2008, a two-year contract extension through the 2010–11 season. Pittsburgh returned to the Stanley Cup Finals for the second consecutive year against the Red Wings in 2008-09. Fittingly, Talbot scored both of the Penguins' goals in the seventh and deciding game of the series to capture the franchise's third Stanley Cup. Limited to just 45 regular season games in 2009-10, a campaign that saw the Penguins bow out of the playoff picture in the second round, Talbot, who had to contend with a myriad of injuries, is as motivated as he's ever been. For Talbot, it translates into doing what he's always done: coming through in the clutch.